This s a stylish designer bistro set. Strong Silver powder coated legs support the 800mm x 800mm table. 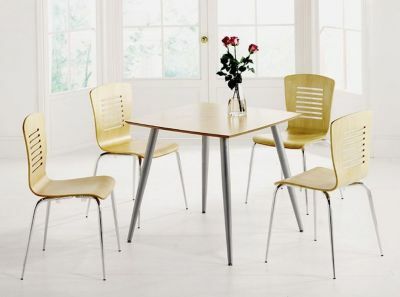 This table is easy to assemble, however you can request our optional install service when ordering. Bistro sets are widely available in many different designs and colours. Whether it is modern or traditional that you need, there are so many bistro sets available on the market and it is quite important that the right decision is made when choosing between the bistro table and chairs out there. This is why we are here at Café Reality and our advisors are available to offer our help and information. We offer high quality bistro sets at affordable prices and our customer service advisors are more than happy to help out wherever possible. Cafe tables and chairs need to be easily cleaned and comfortable. Cafe tables and chairs are used all day and every working day of the year - they are cleaned often and should hardwearing as they are moved and used by different people all the time. 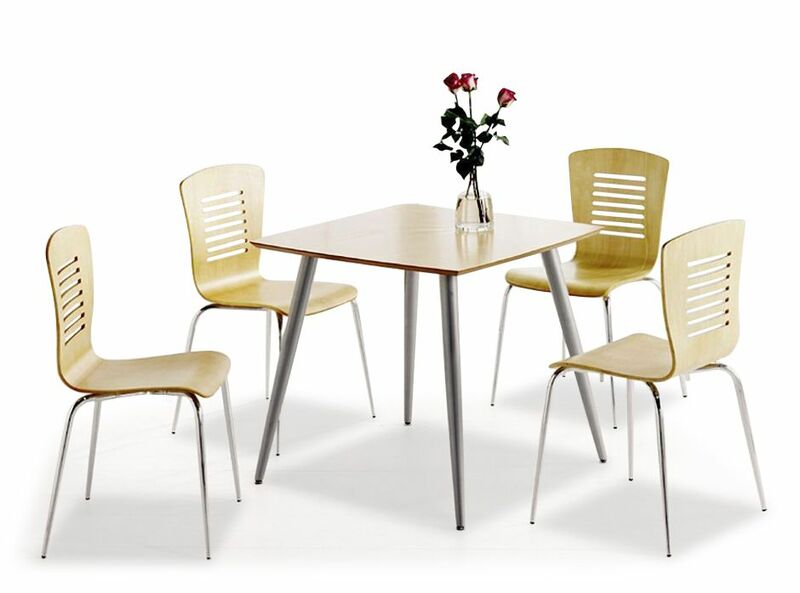 Bistro table and chairs can help give your cafe or bistro a modern look and the should give an inviting and warming feeling to any establishment. Cafe tables and chairs are light in weight so they can also be used outside on a patio or under a shelter during good weather, ensuring you are able to maximise space and profit. They come in all shapes, colours and sizes and these can be mixed and matched to suit your needs. Restaurants are the venue of many different types of meetings, whether that is for romantic meals, work night outs or families and friends conversing over a nice meal. 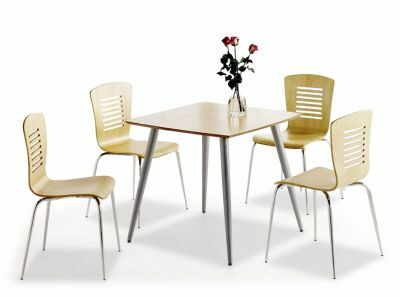 Restaurant tables and chairs need to be comfortable to ensure your diners feel comfortable and wish to return again and again. When going for a meal, you want to take time to relax and enjoy your company and surroundings. Restaurant tables and chairs set the scene in any restaurant, adding to the ambience so you need to ensure that you choose that will meet your needs and achieve the look you want. When choosing your restaurant tables and chairs, you could even take advantage of our free space planning and design option and we also offer a full specification service. This service could also be used when choosing sets to help maximise the space you have available. 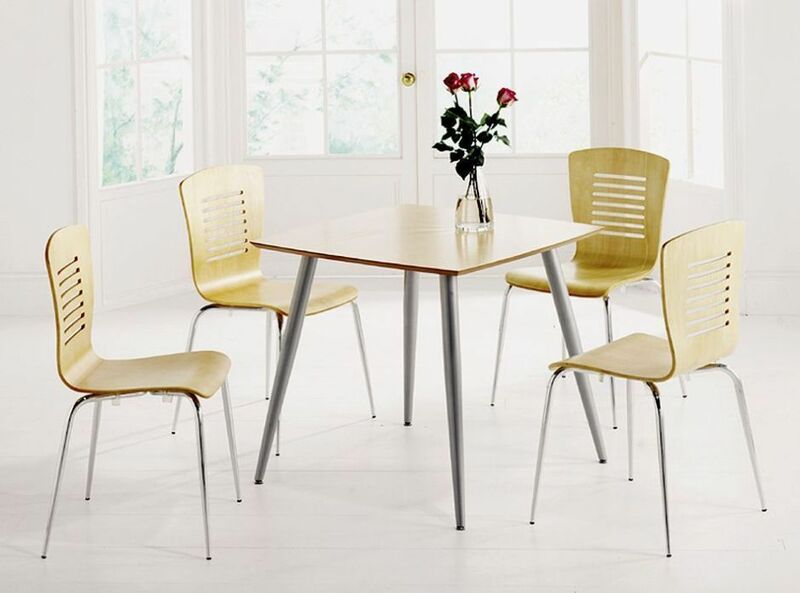 Whichever chairs, stools and tables you decide on we are on hand at Café Reality with all the advice and information that you may need when purchasing them. At Café Reality, we have a group of customer service advisors on hand to deal with any query you may have whether you wish to contact us via telephone or email. Offering free delivery and instant credit means that we will follow through any query with commitment and honesty and you are able to purchase your cafe, restaurant or bistro table and chairs with confidence.